If you want an easy and light technical book on clay, clay bodies, with good tips and clay and glaze making this is the one. Very good info on how clays have originated and picking the right clays and glazes and also fixing problems for beginers to experienced ceramic artists. For every potter, clay is the starting point from which all pottery and ceramic work develops. It can be dry and hard or wet and sticky, smooth and plastic or coarse and rough, and blue, grey, white or pink. But most important of all, it can be changed by fire from a soft malleable working material to a hard, impervious, vitrified substance. 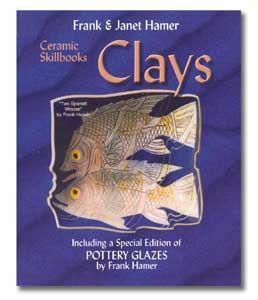 Frank and Janet Hamer describe the origin of clay, its chemical and physical properties, and how to work with it. The best way to learn the nature of clay is to win it yourself: the authors show where to look for it and how to prepare it for use in the studio. By learning to understand the characteristics of the material, its scope for use by the potter can become immensely wide, and successful. This is a book for all potters, whether just beginning to use clay or very experienced in working with the material. A Special Edition of Pottery Glazes is also included. Recipes for glazes, slips and clays fired at 1200°C. The reasoning behind the glaze recipes for those who want to know how—and why.